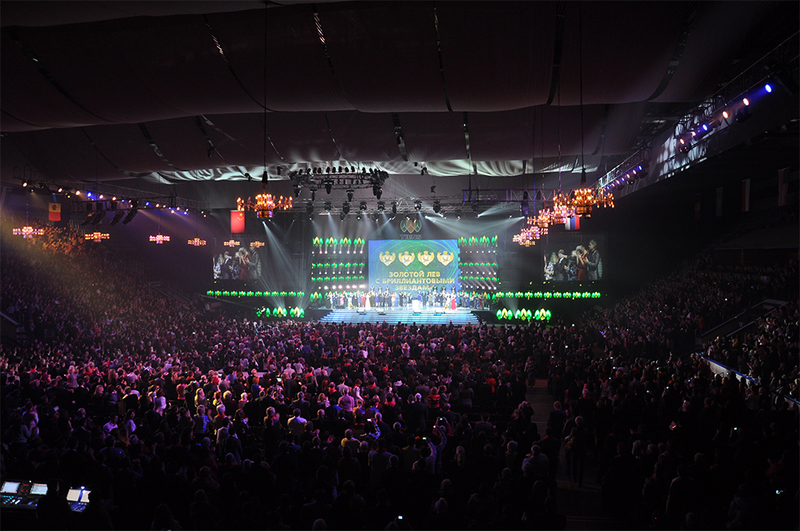 For Tiens Company’s traditional December distributor conference at Moscow’s Russia Hall in SC “luzhniki”, featuring a combination of official speeches and an original concert program for 8,000 guests, Martin Russia provided Lighting Designer Roman Kasaev with Martin Professional M6 console and lighting fixtures. Daniel Maneshin, Technical Director at the Knyazev Agency, offered the main concept for the conference, which featured several LED screens mounted on the main stage. Knyazev Agency played the main role in the business section of the program and also worked as a decorative and informative element. Therefore, while discussing the stage design, Maneshin asked Kasaev to consider this aspect and create a lighting design that fit with the general concept. Kasaev chose 48 MAC 101 compact LED wash lights due to the brightness and colors that complimented the LED screens used at the event. The MAC 101s were mounted on custom-made metal structures between screen modules, 8 pieces per aperture, due to their bright colored lights that fit ideally with the colors of the video-content on LED screens. The event program also included classical ballet and acrobatic features which required a quite different approach to lighting scenario. Kasaev chose 34 MAC III Profiles to highlight the actors and gymnasts during their performances and was able to make lighting accents with beautiful rays and gobo projections. This conference became one more story of success for the Martin Professional M6 console. It was the best solution for this event where such an impressive set of lighting fixtures was involved. As for Kasaev, the Tiens Conference was the first project where he was able to work with M6 console - only a slight change as he is familiar with the philosophy from using the M1 and M2GO controllers before. 50 MAC Aura’s and 12 Atomic 3000 DMX strobes were also involved in lighting design of the Tiens conference.